Established in 1895, Hluhluwe / Imfolozi Game Reserve is the oldest game park in Africa and is the only under formal conservation in KwaZulu Natal where the Big 5 occur. 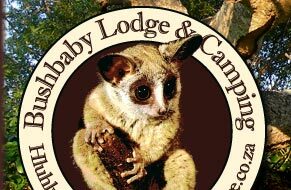 Offering visitors an abundance of activities, from wilderness trails, self guided walks, launch tours and game drives, game safaris as well as the picnic sites, Hilltop restaurant and centenary centre facilities, this park is a prime destination.Hluhluwe was named after the thorny rope climber, 'Dalbergia armata'. This plant is called "Umhluhluwe"in Zulu. Hluhluwe area offers a remarkable diversity, which includes: Zulu culture; Fauna & Flora; Hluhluwe as a Birding Destination. Zululand is known for its legendary King Shaka who called his kingdom kwaZulu, "Place of the people of Heaven". While traveling around Hluhluwe zulu villages set the ethnic African scene while several living museums (traditional Zulu villages) can be visited to provide a unique experience of Zulu traditional life and culture. Included in your pack is a popular souvenir, Zulu beadwork. One of the most fascinating manifestations of this traditional craft is its unique language. Every colour has a different meaning, white represents love, black means grief, loneliness and disappointment, pink proclaims poverty and green implies jealousy. The area with its astonishing variety of habitats gives rise to a multiplicity of fauna and flora, unrivalled anywhere in South Africa. Its abundance of wildlife include: Nile crocodile, hippo, white and black rhino, leopard, lion, cheetah, hyena, elephant, buffalo, blue wildebeest, jackal, giraffe, zebra, waterbuck, nyala, eland, kudu, impala, duiker, suni, reedbuck, warthog, bushpig, mongoose, baboons, monkeys, a variety of tortoises, terrapins, snakes, lizards. 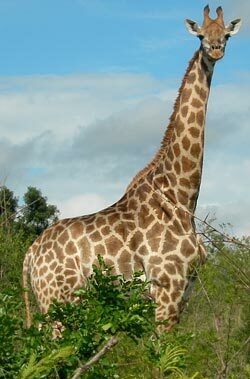 The above can be enjoyed on game drives on open 4x4's, boat cruises, guided walks, canoeing trips and Horse trails. Wildlife opportunities range from privately owned parks to national game reserves, which include the Hluhluwe-Umfolozi Park. The park covers approximately 96000 ha and was established in 1895. Operation Rhino was introduced in the 1960's, which resulted in the growth of the white rhino population in South Africa from approximately 500 rhino's in 1960 to its current capacity of nearly 6000. 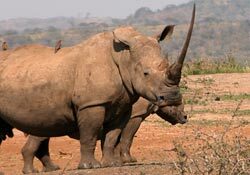 At least a fifth of the world population of black and white rhino are found in the park. The park is a superb wildlife haven and has a variety of species. We believe that Hluhluwe is one of the prime birding destinations in South Africa, for a number of reasons, some of which will be shared by the vast majority of local birders, and some of which will grab the attention of international birders. The freedom to walk in some of the private reserves to do birding. This is pretty unique in reserves that also house wild animals. The best birding is done on foot rather than driving. The variety of habitats within the area. Habitat diversity is one of the prime reasons why the birding community is as it is. 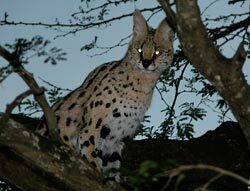 Hluhluwe sits on the intersection of three distinct habitats, palm veld,sand forest and coastal bushveld. This creates a uniqueness that is not found in to many others destinations. The Hluhluwe River Flood Plain is one of the only areas in the whole of South Africa where Yellow throated, Pink throated and Orange throated Long claw species can be seen together. The floodplain houses thousands of migrant water birds, as well as ducks, egrets etc. Three east coast endemic birds can be found in the area namely, Rudds Apalis, Pink throated Twin spot, Lemon breasted Canary. This is a major attraction not only for local birders, but for overseas birders who travel to destinations where there is a likelihood of seeing endemic species. Hluhluwe is also home to some very special birds like Green Coucal, Southern Banded Snake Eagle, Secretary bird, Black winged Plovers and Honey Bussard. Bonamanzi is stronghold for the rare African Broadbill. This little bird is easy to see at Bonamanzi, and is known to breed in the park. It is known in South Africa from only two other rather tenuous sites, and is only known to be present in good numbers in Bonamanzi, Mkuze, Ndumo, etc.